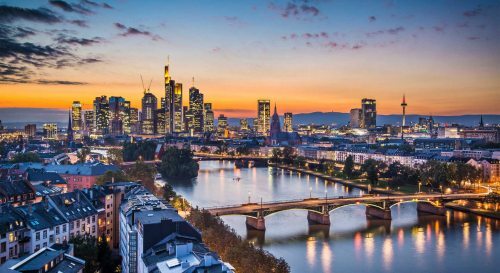 Condor Airlines is showing some well priced flights from Calgary to Frankfurt, Germany in October for $597 CAD roundtrip including taxes. The price of the flights will show up as $558 CAD on Condor.com, but it will really end up costing $597 CAD, because Condor bills your credit card in Euros, which means your credit card company adds 2.5% to the transaction (and annoyingly, Condor doesn't mention this during the booking process). This will start you with a search from Calgary to Frankfurt, Germany. 3. Scroll down to the return flights. Look for the return dates that are $289 CAD. calgary, yyc, flight deals, europe, western europe, central europe, frankfurt, germany and fra. 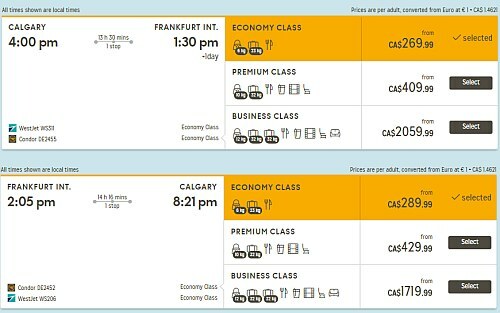 2 Responses to "Calgary to Frankfurt, Germany - $597 CAD roundtrip including taxes"
Some credit cards don't charge the 2.5% foreign transaction fee. We booked a recent flight to Peru using YYC deals with Aeromexico. We paid in CDN$ but the tour package we booked through the provider in Peru only gave us the option of paying in Euros or USD. So we paid with our (no annual fee) Amazon.ca Visa card and paid no foreign transaction fee. We saved $150 that way. Yep, it's a great card! Although cards that don't charge the 2.5% foreign transaction fee are definitely the exception and not the rule. Only a handful of cards have this feature. Unfortunately the Amazon visa is no longer accepting new applications.